This is a very polished single screen arcade action game, in which you play as Moebius – who must avoid baddies on platforms whilst collecti... hang on, déjà vu! 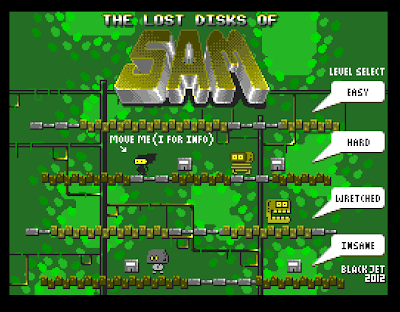 Yes, The Lost Disks Of Sam is a very punctual remake of 'The Lost Tapes Of Albion' for that little supported and eccentric 8-Bit, the SAM Coupé. The SAM Coupé itself was an ill-fated home computer by Miles Gordon Technology, and performed like a pimped up ZX Spectrum. In this game BlackJet have taken Dave Hughes' game, and performed a similar make-over. So, for those not paying attention, that’s … 2010: a Philatelists Odyssey begat Stamp Quest, which begat EFMB, which in turn begat The Lost Tapes Of Albion, and this then gave us The Lost Disks Of Sam. But enough with the history lesson! What about The Lost Disks Of Sam as a game in its own right? It is certainly very playable, and much prettier than any of its parents. The graphical overhaul has been done with taste, and the sprite work is vibrant throughout (obviously no colour clash here). As a non-SAM Coupé aficionado I am unable to tell if the disks collected have the same punning quality as the Speccy game, but there is none of the textual descriptions that add to the speccy version's humour – instead a rather nice animation plays – but once you've seen it, you've seen it. An addition to this version is the idea that Moebius upgrades his suit (and it's colour) after completing a stage – and touching a baddy on a stage first knocks away his suit upgrades before completely resetting the level. This is a nice touch, but in a strange aesthetic decision the colour of the suit starts basically black, against a black background. Which means Moebius is initially very hard to see – unless you change the background colour (which can be done from the instruction screen by pressing 'Enter' although this does not appear to be documented anywhere). Another addition is the notion of difficulty levels. Here some problems start to arise – 'easy' is very easy, with a very simple screen layout and no Attribute Snake or booby-trapped collectables to deal with. As such it is easy, but is also very little fun. The higher difficulty levels (Hard, Wretched and Insane) add these components back in, and make the platform layouts less easy to navigate (less/inconveniently placed teleport pads between platforms). Unfortunately all of these difficulty levels are much harder than the 'easy' level, and upon playing it feels that the 'normal' sweet spot between 'easy' and 'hard' has not quite been hit here. Another fly in the ointment is the dreaded Attribute Snake which moves very quickly, and must be avoided. 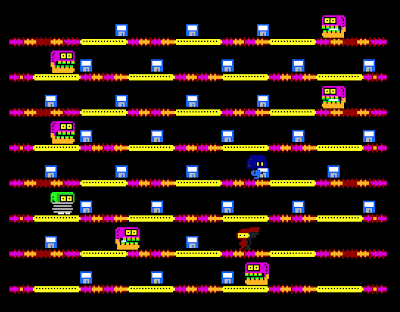 Moebius starts at the top left – as does the snake, but on some stages a snake will arrive on the screen about a second after Moebius does, and without a crystal ball a suit upgrade will be lost. This means that some degree of learning the stage, and knowing how to avoid the first few baddies is required - which robs the game of some of its fun to be honest. Whilst not perfect, this game shows just how great a SAM Coupé could look. Hopefully BlackJet will take a leaf out of Dave Hughes' book and refine and tweak their game, and it will end up being an essential franchise on the SAM, giving people a reason to play this oft overlooked retro computer. Sadly, at this stage The Lost Disks of Sam lacks the refined playability of the parent games. And it just goes to show - children should respect their elders. 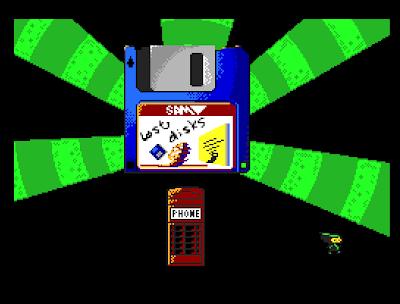 (It's not often that we revisit a review here at RGCD, but in light of Andy's comments BlackJet released a update to The Lost Disks Of Sam that fixes many of the issues he had with the game. As a result of this, he requested the following addition to his write-up). In above the review I was slightly critical of Lost Disks Of Sam for a number of reasons – my main complaint being that some of the design decisions makes it unfair in places. Well it turns out that BlackJet are a 'customer responsive' developer, and has made a new-improved version addressing these issues. Under a fortnight later we have been presented with version 1.5, a major update hoping to address these very issues. 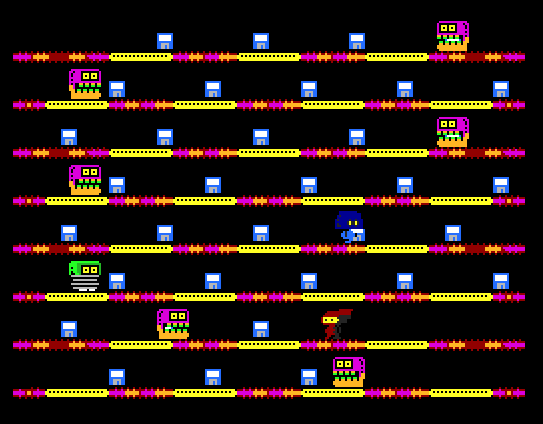 The main improvements – and I am pleased to say that they are improvements – are giving the player couple of seconds of invulnerability at the start of a level, and making the Attribute Snake a lot fairer, with a red flashing border warning just before it emerges on screen. 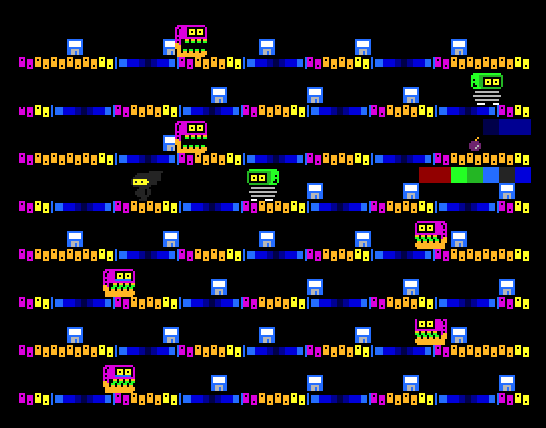 Coupled with the level progression being tweaked to be a lot more progressive the whole game plays much better. 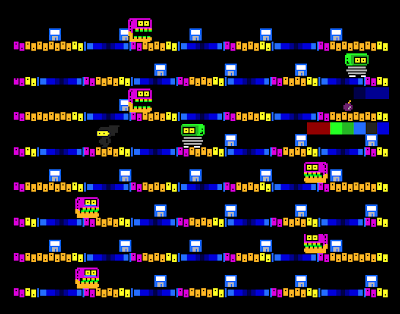 Other minor improvements come in the form of selecting the base colour for the player at the start (avoiding him being difficult to see on the screen), and being about to skip the cut scene animations by pressing a key. Overall this is a significant improvement on the original, and well worth the time to reinvestigate. It is no longer just a prettier, yet empty, imitation of its parent - it has grown into a beautiful offspring that has inherited the great qualities that made Lost Tapes so addictive, yet has its own identity. Andrew Gillen at Blackjet should be applauded for being so alert to player feedback – remarkable on a free product! Download the game from here (from the BlackJet site). Run it using SimCoupe (freeware). Thanks for the review. Very fair and I agree with many of your criticisms. Stay tuned for an EFMB re-implementation of the Lost Disks, coming to a SAM Coupé super-computer soon! (Don't hold your breath though).